Moru Kuzhambu or Buttermilk Stew is a very popular dish in Southern India, of course next to the 'sambar'. I do two different versions, one is this and the other one is the already posted Kerala Style More Kuzhambu which tastes completely different. 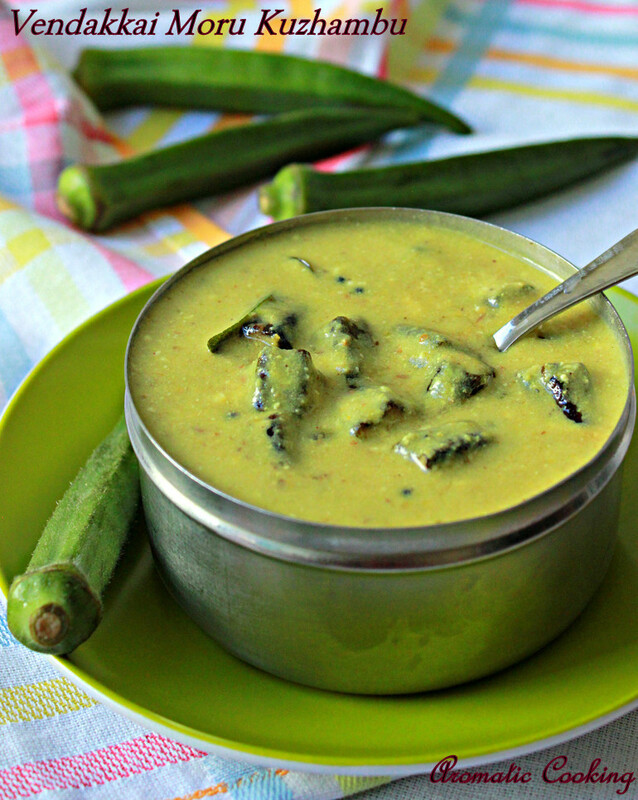 Coming to today's one, it's usually prepared using lady's finger/okra or ash gourd or even with vadas/lentil fritters. The buttermilk used is slightly sour, replacing the tomatoes or tamarind which are usually used as the souring agents, but I don't like the buttermilk to be too sour. 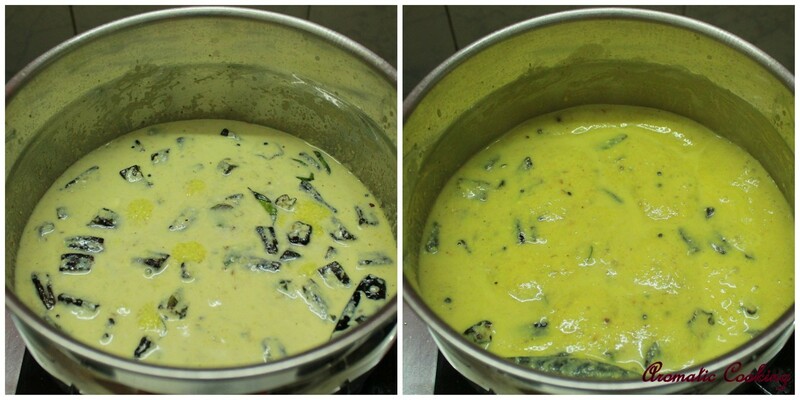 You can even use the store-bought one, it tastes really good..
Soak the tuvar dal for an hour and grind it with all the ingredients given under 'to grind'. Heat some oil, add the okra pieces, saute on medium heat, till it looses the sliminess and is cooked, add a little salt towards to the end. Mix the ground paste,yogurt and keep. 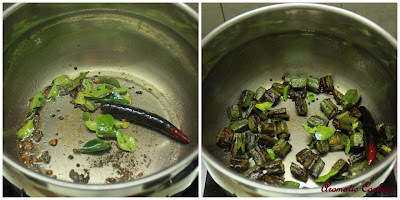 Once again heat some oil, add the mustard seeds, once it starts spluttering, add the fenugreek seeds, red chilly and asafoetida, mix and then add the curry leaves. Saute for a few seconds, add the already sauteed okra and mix. Add the yoghurt mixture, salt and 1/2 cup of water, once it starts bubbling and getting ready to boil, switch off. Serve it warm with rice. I prefer sauteing the okra separately, you can add it after the curry leaves, saute it, add a little water and cook. If using buttermilk, then reduce the amount of water added or do not add water, yogurt is more thicker, so I have added around 1/2 cup. Also, do not let it to boil, then the yogurt would start to curdle, so switch off immediately, when you see it bubbling. Also you can increase the amount of coconut to 2 or 3 tablespoons. wow.. its been a long time i have had this.. one of my fav dishes.. love the colors hema! healthy and delicious recipe... perfect!! That sounds really interesting, seems like okra is usually dry...very creative! Very healthy and yummy curry. Very nice Hema. I love this curry. Pics are gr8 too. 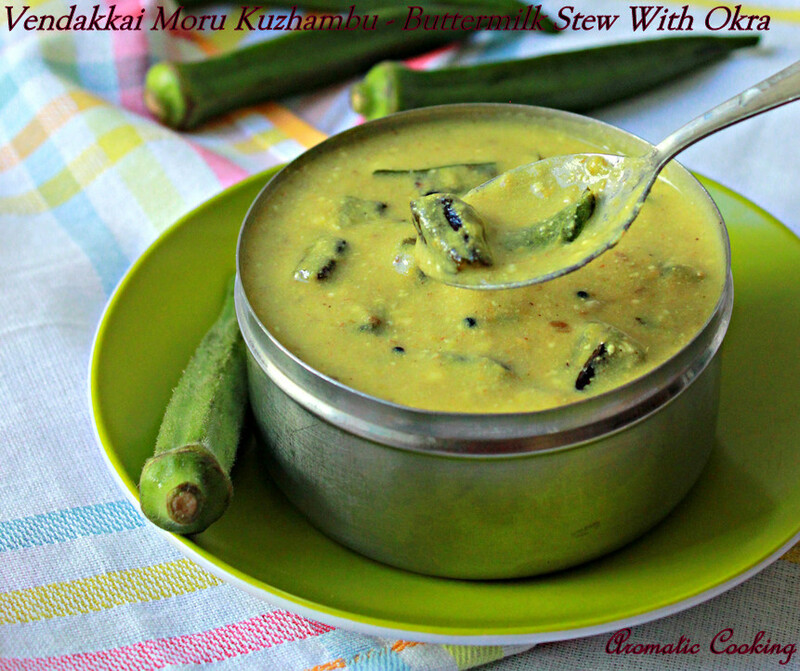 Delicious more kulambu love it with simple appalams :) Looks so delectable!!! It looks so delicious! Only had stir-fried okra before, this looks really great with buttermilk.